Let's make this the official plugins/VST thread, so anyone interested in finding more instruments/effects/compressors/eq's/etc. can find it here. Please, tell us your favourite plugins! I will update the first post frequently with every single plugin added by anyone. Waiting for the rest from you! Last edited by Zero-Blade on Tue Nov 13, 2007 10:46 am, edited 9 times in total. psp nitro and ohmforce plug ins are really good.. Updated with a couple new VSTs. 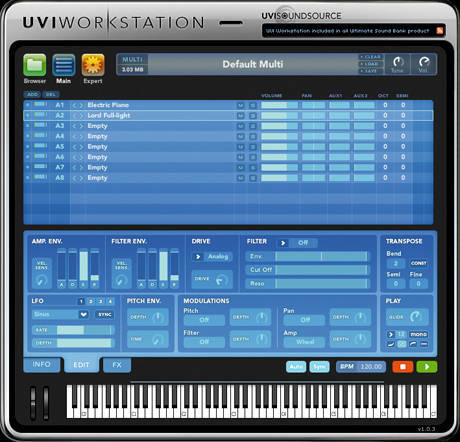 UVI Workstation is a multi-timbral instrument that provides unlimited parts, integrated effects, live performance features, and a smooth real-time workflow. • Cross Platform compatible with Mac and Windows. • Import REX files, Apple Loops, AIFF , WAV and more.